Being green is in our nature. 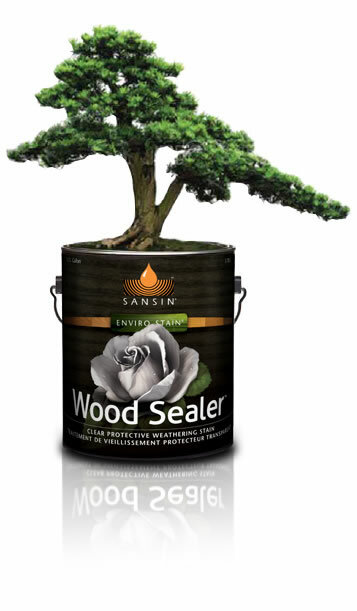 For over 30 years, Sansin has pioneered the use of environmentally-friendly stains and sealants. Our unique water-borne technology is inspired by a thousand year-old tradition that uses nature’s own ingredients – resins and gums from the heartwood of trees – to deliver long lasting, sustainable protection. We continue to develop innovative materials and processes that reduce the impact of our coatings on the environment. Again and again our history has demonstrated that going green actually enhances performance. Innovative products that don’t harm you or the environment. Our innovative wood coatings, chinkings and sealants already provide consumers with environmentally-friendly alternatives to solvent based products. But that’s just the beginning. At our Research & Development Center, we’re focused not only on continually improving the performance of our products but also on reducing their environmental impact. Our wood coatings use a unique water-borne alkyd formula that combines the benefits of both oil- and water-based coatings, reducing environmental toxins – such as VOCs (volatile organic compounds) that contribute to smog and ozone depletion – to almost zero. Even when it comes to color, we’re “green”! Rather than using toxic dyes to color our stains and sealants, we’ve harnessed nanotechnology to create Sansin Microfines – pure pigments ground so fine they deliver remarkably vibrant and lasting colour deep into the wood. Reducing waste through continuous innovation. At Sansin, we constantly look to minimize waste and ensure responsible handling of waste products. For example, a unique rinse water recycling system allows our production cleaning processes to capture and reuse raw materials that would otherwise have been wasted. Regular facility improvements and operating initiatives such as the Sansin Second Nature program focus on energy savings, waste reduction and recycling, further reducing our environmental footprint. We’re not just environmentally-friendly, we’re Eco2. We’re proud to announce our new Eco2™ brand – a wood stain entirely derived from recycled exterior or interior Sansin products. Formulas are specifically designed to protect and beautify exterior wood surfaces such as siding, decks, timbers and millwork. View more information on Eco2. A greener today, a greener tomorrow. Wood is our passion and our commitment to protecting it and the environment is paramount. Our mission is to continually improve our products as well as our corporate environmental practices. As part of our Sansin Second Nature program we are pursuing initiatives such as using alternative green energy and smart manufacturing processes that move us closer to our objective of operating a sustainable zero waste production facility.